at this week’s EMC World. 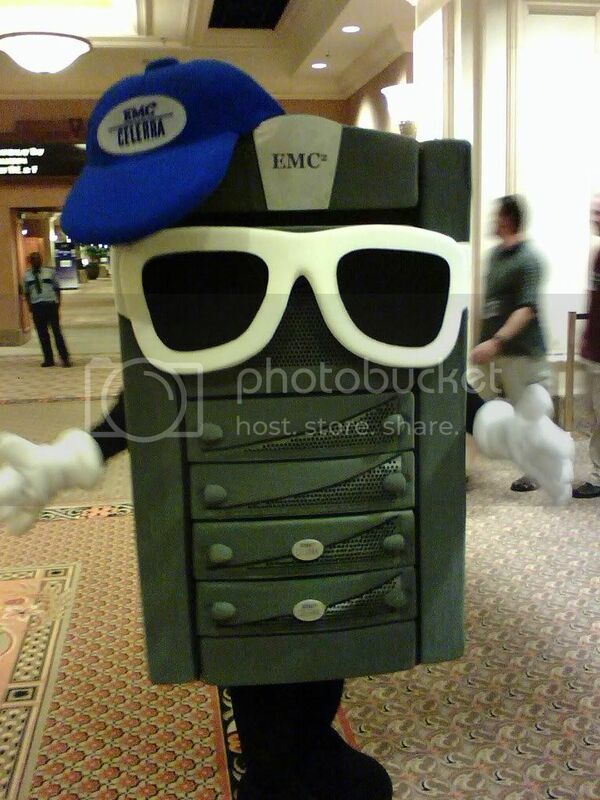 There’s plenty going on out here in Vegas with EMC World in full swing. It seems like there are attendees, press, analysts and EMC’ers stashed in every hotel on the Strip, and about 10,000 people milling around the corridors of the Mandalay Bay Convention Center. There’s also been plenty of product news so far. EMC finally unveiled its deduping VTLs based on software from Quantum, one of which will also be the first Clariion array to offer drive spin-down, a feature EMC has promised in multiple products going forward. Also on the docket: incremental updates to Avamar’s software and Data Store hardware, and a new mid-market package for Networker. But the subject on everyone’s lips in the whispering corridors was the one product EMC didn’t spend much time at all talking about: its Web 2.0 storage system, codenamed Hulk and Maui (looks like Hulk’s real name will be InfiniFlex). While Hulk is shipping, Maui is, to quote StorageMojo blogger and Data Mobility Group analyst Robin Harris, “conspicuous by its absence.” Others who sat in on CEO Joe Tucci’s Q&A with analysts this morning said he was reluctant to answer questions about Hulk and Maui, and his face seemed to darken for a moment when I asked him afterwards if Maui had joined Hulk in shipping yet. But he also gave a straightforward answer, saying it’s not shipping yet but it is scheduled to do so this summer. Word has it Hulk will ship with clustering software from Ibrix. I’ve heard rumblings about what Maui’s major malfunction might be, but nothing definite. Meanwhile, Harris told me that at the show he encountered a customer who’d been given a demo of Maui and described it as a layer of softwre that sits above local storage pools, “which could serve as a global data repository for multinational companies, tying multiple data centers together.” If that’s the case, it wouldn’t be surprising if getting things synchronized on that kind of scale took some time. And it would also explain why you could run Hulk without Maui, and Maui without Hulk. But we’ve got another couple of months (it seems) before we find out for sure if the rumors about Maui are correct. Why would somebody wait for a Product from EMC, while a much more solid Product exists from IBM (Scale Out File Services) since last year, is proven to work and has Customers running it ? Beside this it adds build in DR and ILM Functions and is the most scalabale Product i have ever seen and tested on my own ..